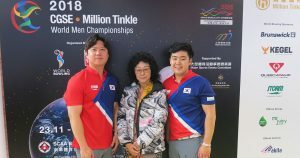 Two teams from the Pan American Bowling Confederation (PABCON) and two teams from the Asian Bowling Federation (ABF) advanced to the medal round in Doubles in at the 2018 CGSE • Million Tinkle World Men Championships in Hong Kong, China. 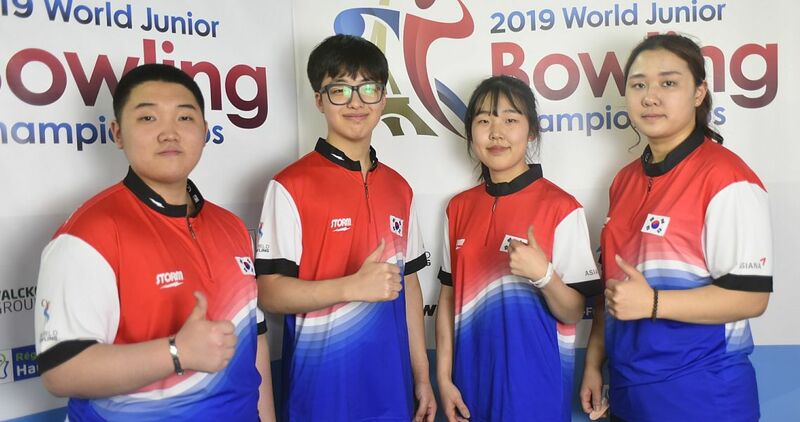 United States, Canada, Malaysia and South Korea will bowl for the medals on Sunday, Dec 2, at SCAA bowling center in Causeway Bay. In the semi-finals, USA bowls South Korea and Canada takes on Malaysia. 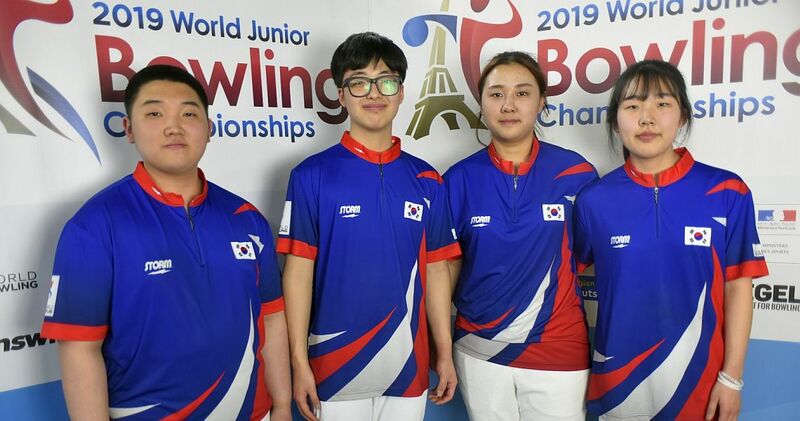 Featured photo: The top 4 of Squad 4 from front right, clockwise: Kim & Park (KOR), Konsteri & Jähi (FIN), Wilkins & Hupé (CAN) and Ong and Goh (SIN). 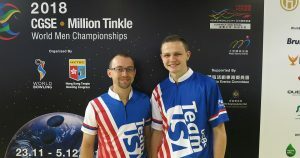 Bowling in their first World Bowling World Championships, EJ Tackett and Andrew Anderson (left, l-r) from the United States had games of 458, 449, 531, 443, 449 and 426 in Squad 3/4 to lead the field of 132 doubles from 47 countries with 2756 total and an average of 229.67. 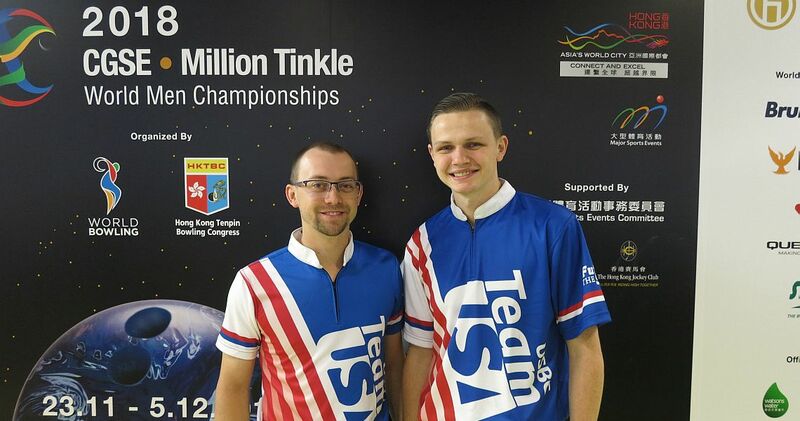 Tackett, 26, who earned Professional Bowlers Association Player of the Year honors in 2016 led the way with 1421 (236.83), while Anderson, 23, who was announced as Player of the Year 2018 last week, contributed 1335. 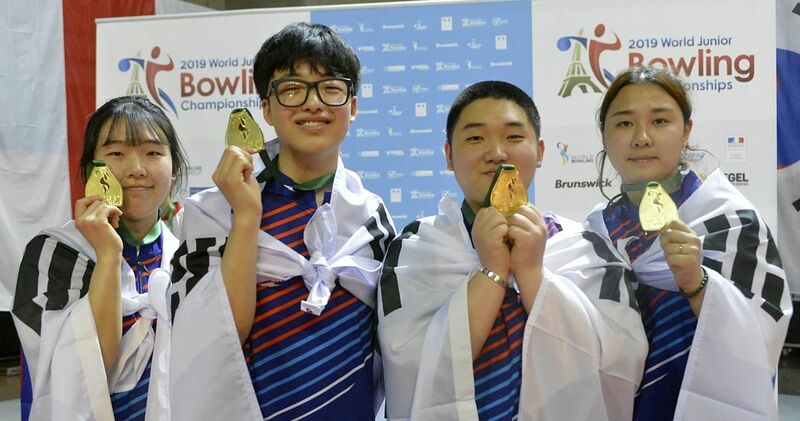 Anderson, who posted the first 300 game of this Championships on his way to the top seed in Singles with 1473, has already secured his second medal in as many events. He also leads the 265-player field in all-events (total pinfall in singles, doubles, trios and team preliminaries) as the discipline has reached the halfway mark. railing the Americans by 90 pins to take the no. 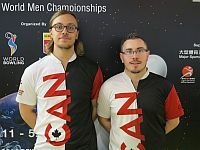 2 seed were Canadians Dan MacLelland and Francois Lavoie (right, l-r), the Doubles champions of the X World Games 2017 in Wroclaw, Poland. MacLelland, who qualified for the Singles finals in the no. 4 position, targets to win another gold medal after his victory in Singles at the World Men Championships in Abu Dhabi, UAE, 2014. He led the team with 1375, including a 299 opening game. Lavoie, the 2017 World Champion in Masters and the 2016 U.S. Open winner added 1291 for 2666 total (222.17 avg.). 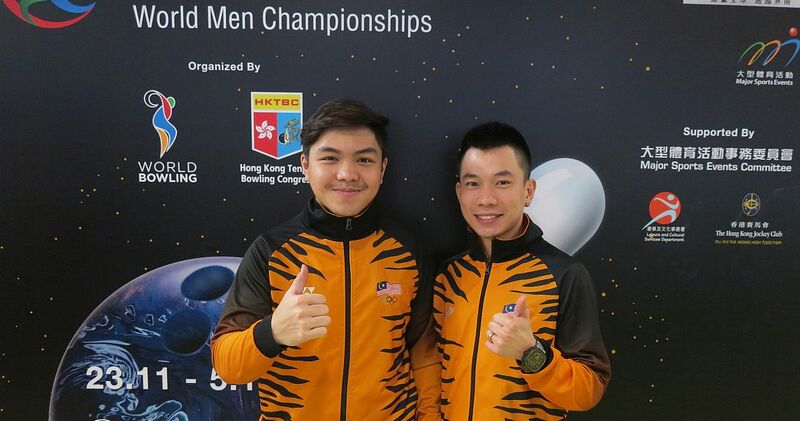 Overnight leaders Adrian Ang and Tun Hakim (left, r-l) of Malaysia, who led the second squad with 2596 (216.33), finished in third place and secured the second medal for their country after teammate Rafiq Ismail advanced to the Singles finals as the no. 3 seed. The fourth and last spot for the medal round in Doubles came down to a 10th frame showdown. 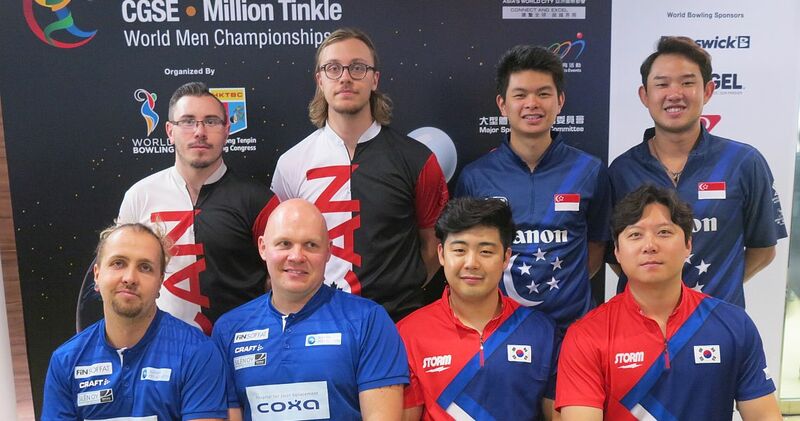 Korea, Finland and another duo from Canada were chasing Squad 1 leaders Jakob Butturff and no. 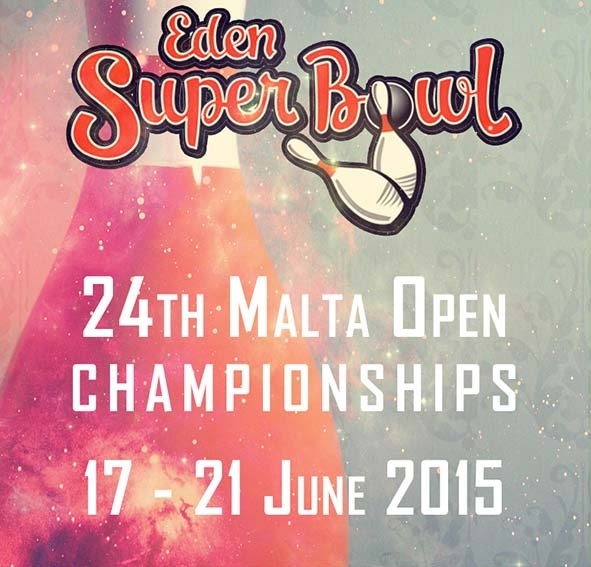 2 seed in Singles, Kyle Troup, USA, who were “on the bubble” in fourth place with 2549 (212.42). 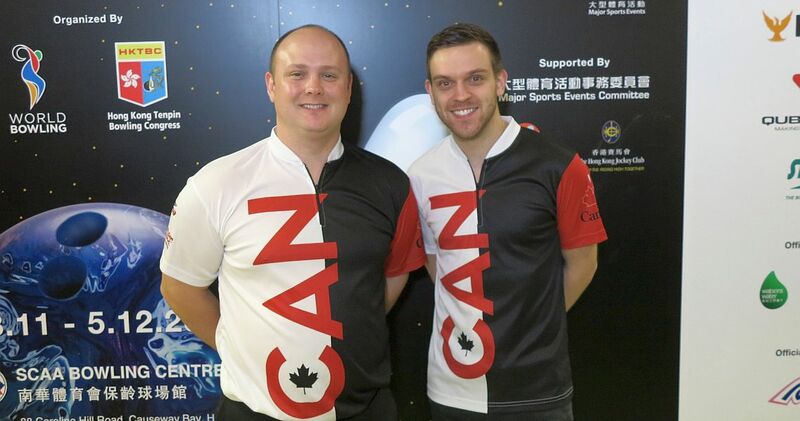 Finishing earlier than the other team involved in race for fourth place, Canadians Zach Wilkins and Mitch Hupé (right, r-l) closed with a big 489 game to tie the Americans at 2549. 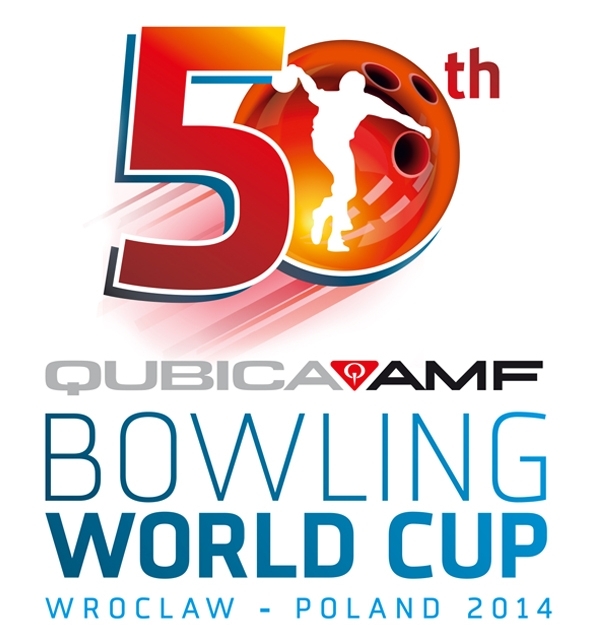 Ties for 4th and 5th place in World Championship preliminaries would be broken in a one-game roll-off in Baker format. However, Finland and Korea had other plans. 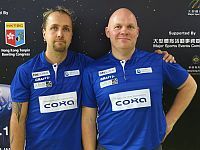 Finns Joonas Jähi and Sami Konsteri (left, l-r) used a 401 last game to move past USA and Canada with 2564. 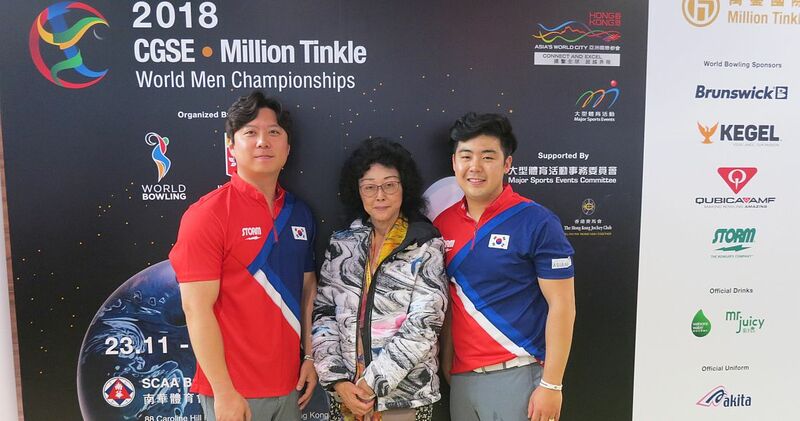 This would have been enough to make the finals if Korea’s Park Jongwoo and Kim Kyungmin wouldn’t have doubled in the 10th frame. 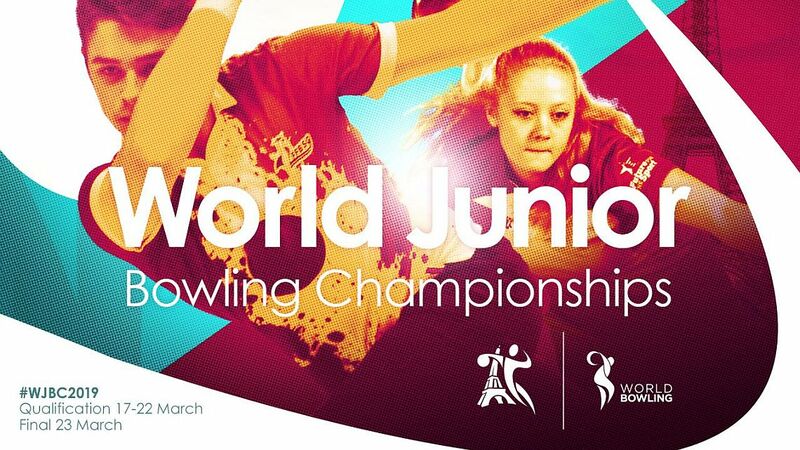 Finland finished fifth, the highest position for Europe in this Championships so far (Steven Gill of Scotland was top in Singles in sixth place). Canada was sixth and USA seventh. 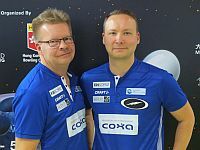 Kimmo Lehtonen and Jari Ratia (left, l-r) of Finland ended up in eighth place with 2529 and were followed by Colombians Jaime Gonzalez and Santiago Mejia (right, l-r) in ninth place with 2512. 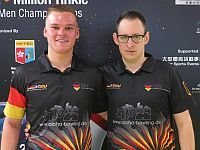 Germany’s Fabian Kloos and Timo Schröder (left, k-r) were last team that surpassed the 2500 mark in 10th place with 2504. 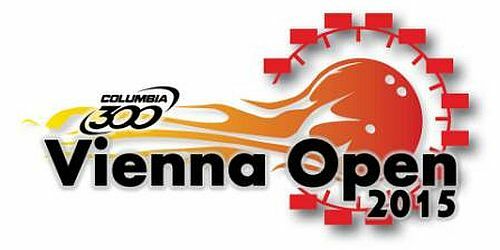 20-year-old Kloos rolled the second 300 game of this Championships in the third game of Squad 2. Darren Ong and Jaris Goh (right, l-r) were fourth in squad 4 to finish in 11th place with 2498. 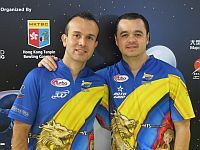 Defending champions Chris Barnes and Tommy Jones, USA, finished in 31st place with 2410 (200.83). With two out of four events in the books, Andrew Anderson (left) leads in all-events with 2808 total and an average of 234.00. Dan MacLelland moved into second place with 2724, while Kyle Troup slipped one spot to third place with 2714. 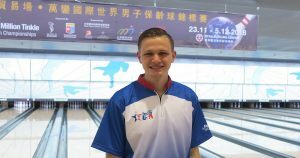 EJ Tackett jumped from 26th to fourth place with 2682 thanks to the highest individual series in the Doubles preliminaries (1421). Rafiq Ismail slipped to fifth place with 2622. Pontus Andersson of Sweden is the best European bowler in 10th place with 2565. 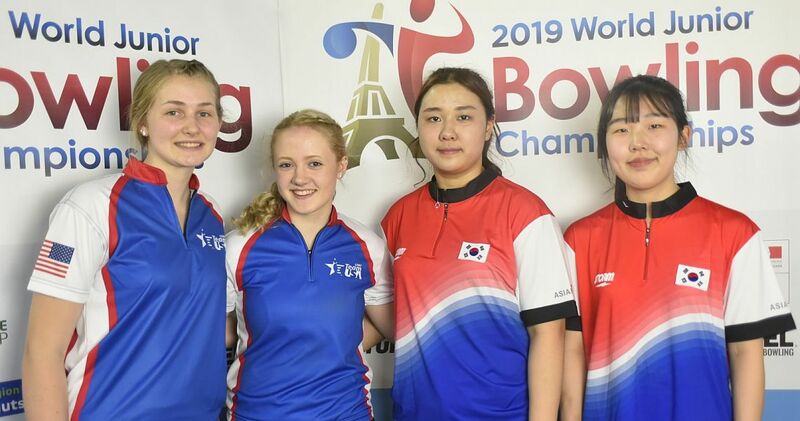 The field will be split into three squads for the Trios preliminaries which will take place Thursday (first block of three games) and Friday (second block), Nov. 29 and 30, starting at 9,00, 12.45 and 16.30 Hong Kong Time.